Just What Are Heirloom Vegetables, Anyway? Heirloom vegetables, such as tomatoes, are all the rage at trendy farmers markets everywhere these days. Heirloom vegetables are all the rage these days at trendy farmers markets everywhere. But you might be wondering, just what are heirloom vegetables, anyway? We’re so glad you asked. We’ll take a closer look at these yummy vegetables and hopefully help you achieve a greater understanding of what sets them apart. Intrigued? Keep reading to find out more. The first thing that sets heirloom vegetables apart is their age. We don’t mean how long they have been a piece of produce; we mean the age of what’s known as the cultivar. Some experts claim that cultivars from after 1951 make the best heirlooms. However, other experts cling to the notion that the best ones were from even earlier in the 20th century. In this case, that year would be somewhere in the 1920s or before. Some gardeners who seek to replicate British Victory Gardens of World War Two, cite the 1920s, 30s, and 40s. Even though some cultivars are over 100 years old, some can be even older. In fact, some varieties predate Columbus’ arrival in the New World or come from ancient Africa or Asia. Next, the cultivars that are destined to become the freshest, tastiest heirloom vegetables must be pollinated. Many crops and types of produce need pollination to begin growing. But open-pollination is the difference maker here, as when it comes to growing produce, open-pollination ensures that the next generation is identical to the one that came before it. Even so, this name is somewhat misleading, since it’s essentially a closed circle. The big takeaway here is that the seeds are supposed to come back true-to-type, which is the term for when one heirloom vegetable spawns an offspring that is exactly like it. Still, this process doesn’t always happen. The last reason heirloom vegetables are so different, and yes, better, than their non-heirloom counterparts is that they’re just higher quality veggies. 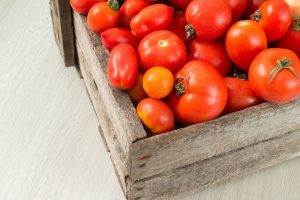 Tomatoes taste like tomatoes should, with that distinctive sweetness, and not wax. Besides tasting great, the best heirlooms look fantastic as well. As attractive as they are, none of it matters if they aren’t easy to grow. For expert farmers such as us, the problematic custom grows you might order aren’t a challenge, but we know they can be challenging for less-experienced growers or buyers. This entry was posted on Friday, October 20th, 2017 at 11:31 am. Both comments and pings are currently closed.